Exciting new images have been released by the City of Rio showing the first seats to be installed in Carioca Arena 3, which will host fencing, taekwondo and judo during the Games. 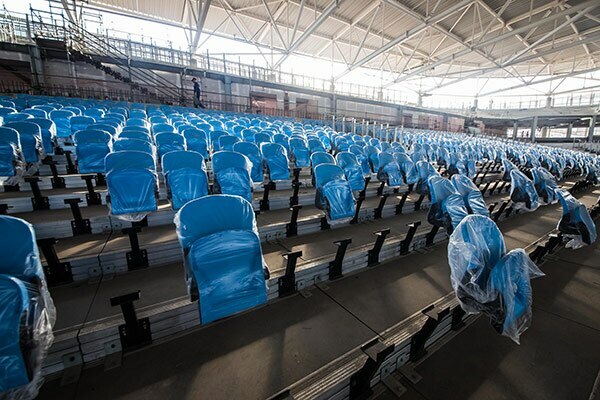 It is the first new venue on the Barra Olympic Park to start having its seating installed, with all 10,000 blue and green seats expected to be in place by the end of June. Shortly after Arena 3 is complete, seating will be installed in Carioca Arena 1, which will host basketball, wheelchair basketball and wheelchair rugby; and Carioca Arena 2, which will stage Olympic judo and wrestling, plus boccia during the Paralympic Games. The metallic roof of Carioca Arena 3 is also complete, and the installation of the 285 wooden beams that will form part of its facade began in January. The sinuous aluminium sections that interlock between the beams are also currently being installed.